Rugrats: Go Beyond the Panels with Box Brown and Lisa DuBois | YAYOMG! Hold on to your diapers, babies! 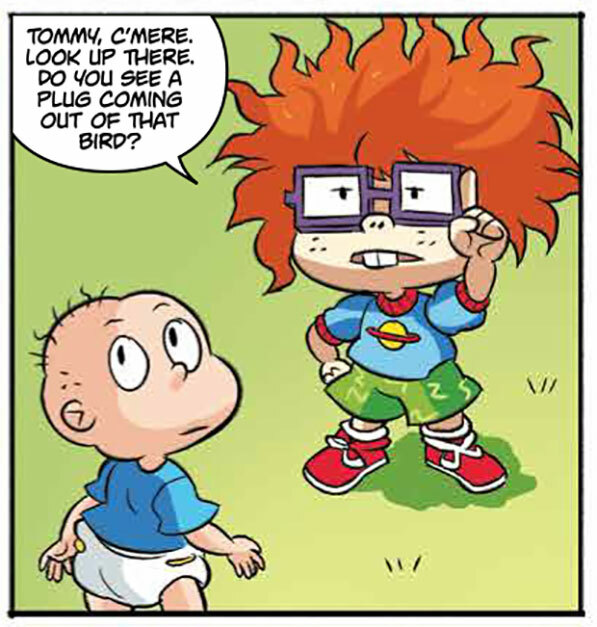 Tommy, Chuckie, Phil, Lil, and Angelica are back and ready to take on the world in their brand new comic series from KaBOOM!. Nickelodeon and BOOM! Studios are working together to publish comics and graphic novels based on a few fan-favorite Nicktoons. The Rugrats comic was the first, hitting comic shops back in the Fall, and a series based on Rocko’s Modern Life was released in December. These revival series will feature all-new stories featuring some of the most iconic, hilarious, and beloved characters in Nick history. 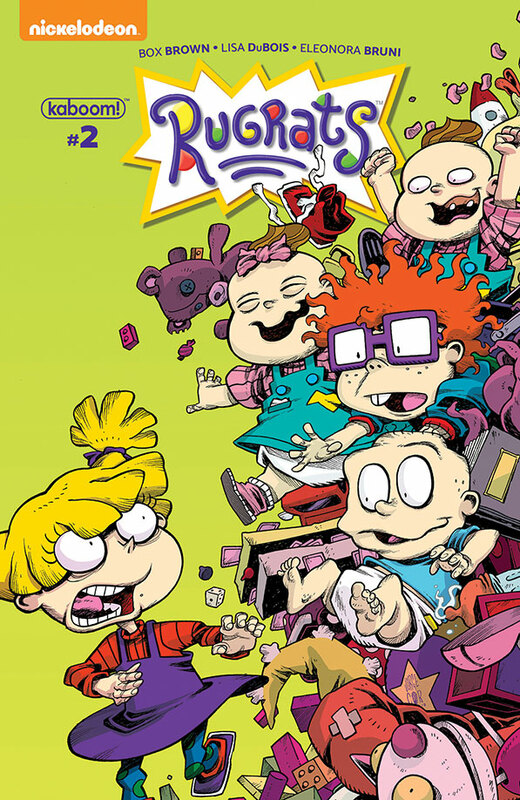 Rugrats kicked off in October, re-introducing us to the babies and their modern-day struggle – constantly connected mommies and daddies! From baby-cams to drones, Tommy and his friends are always being watched, and it’s ruining all their fun! Determined to get to the bottom of who’s watching them and reclaim their control over their parents, the babies must take on compoopers (computers), the strange bird in Chuckie’s yard, and all other electronic devices that are making playtime a total drag. 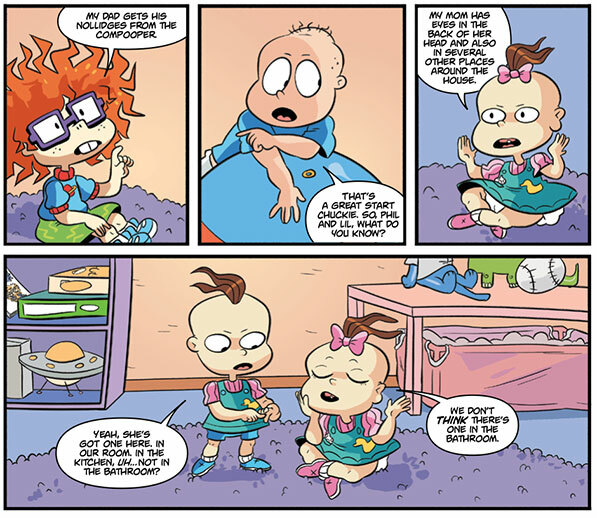 One of the things both the original cartoon and the new Rugrats comic series does really well is visually representing the wildly vivid imaginations of the babies. They’ve always been able to transform a boring situation into an amazing adventure, and we love the way it reads in the comic. To the adults, the babies are just playing with the sprinklers in the yard, but in their minds, it’s an epic battle against Reptar! The fun is endless when you’re a baby with a big imagination and a whole lot of courage. The entire series really captures the spirit of the Rugrats, leaving readers with an incredibly fun, silly, and heartwarming comic to flip through each month. We had the pleasure of chatting with writer Box Brown and artist Lisa DuBois about what it’s been like to give new life to the Rugrats and what readers can expect from the series. What types of adventures can readers expect from the Rugrats series? LISA DUBOIS: Readers are going to get to see imaginative adventures by their favorite intrepid babies, but in a more modern context! Aliens! Dragons!! Cookies? Nothing is off limits. 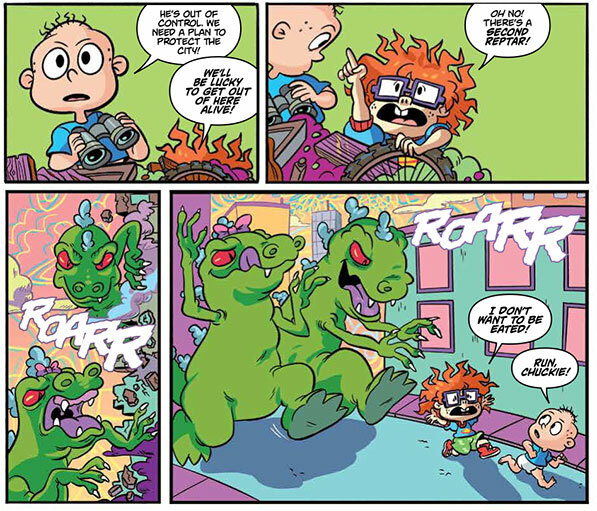 Even though it’s been ages since we’ve seen any new Rugrats stories, the spirit of the animated series really comes to life in the comic. How do you balance adding in modern references with a show that was so very 90’s? BOX BROWN: I think in my brain it’s still the 90s sometimes. I still catch TV shows from the 90s and watch them when they’re on TV like Saved By the Bell and Family Matters. LISA: I think it’s easy to plop Rugrats in a modern setting because the spirit of the show is infinitely true. No matter what new tech comes into existence, babies are adorable and using your imagination is awesome. Visually, I’ve tried to keep the smart devices simple and unobtrusive so that the babies can shine. Do you have a favorite character to write or draw? Who is it, and why? BOX: I love writing Phil and Lil. I think their relationship is cute. My wife is a twin and sometimes I think about her and her twin when I write Phil and Lil. LISA: Phil and Lil are my favorites to draw. They’re sassy and gross and get all of the best facial expressions. Can you share a challenge you faced while working on the comic and how you solved/overcame it? BOX: Well, sometimes I use things from my real life in my writing. I have a little baby boy at home and for a while I was playing this game with him where I pretended he was a robot and I would call him robo-baby and then later I wrote robobaby into a Rugrats comic. LISA: One of the biggest challenges is just paying homage to one of my favorite Nicktoons. I love these babies, and having the opportunity to bring them back was really kind of intimidating! I did my best, with love, and I’m so proud of this comic!! Very important question: What is your favorite Nicktoon? LISA: Avatar: The Last Airbender! I grew up with Nickelodeon and have loved many Nicktoons, but Avatar is very special to me. Rugrats is definitely toward the top of my list, but watching Avatar is such a unique experience. Our YAYOMGers love reading comics but don’t know much about the hard work behind the scenes that goes into to creating one. How do you collaborate with the rest of the creative team to bring a comic to life? LISA: The process of working on Rugrats is great. I get an amazing Box Brown script, I thumbnail, pencil and ink it, and then pass it on to be colored by Eleonora. I really didn’t know what to expect from the process of collaborating with a team to work on a comic. Before I started working on Rugrats, I’d never experienced working off of somebody else’s script or having somebody else color my drawings in a professional setting, but it’s awesome! Just being able to focus on drawing gives me a lot more freedom to experiment and grow! What were some of your favorite comics/books that you loved as a kid? BOX: My favorite books when I was a kid were the choose your own adventure books. It was like playing a game while reading. And, I also loved Calvin and Hobbes. LISA: When I was a kid, I would read anything that had to do with history or magic. Any combination of the two blew my mind. I loved American Girl, the Dear America series, and of course, most of all, Harry Potter. Comics-wise, I would read whatever superhero comics my brother Ryan was collecting, so there was a lot of X-Men in the mix, too. Can you share any advice for our readers who dream of working in comics one day? BOX: It’s not a dream. It’s a reality already. Once you pick up a pencil and make a comic you’re IN COMICS. That’s all it takes to start and it’s a lifetime journey. Just never quit, never get discouraged. When I was a kid I loved to draw but I didn’t think I was good enough so I stopped and didn’t start again until I was an adult. I wish I never quit! Your drawing is good enough already. LISA: Be kind and draw a lot. Do your best, but recognize that your ‘best’ is flexible. Cherish your friendships and surround yourself with other creative, kind people. I don’t think I would be doing comics today if it weren’t for my best friend in the whole, wide world, Carolyn Nowak, who is another cartoonist and is just wildly talented. So, yeah! Be kind to yourself and others, and draw!! 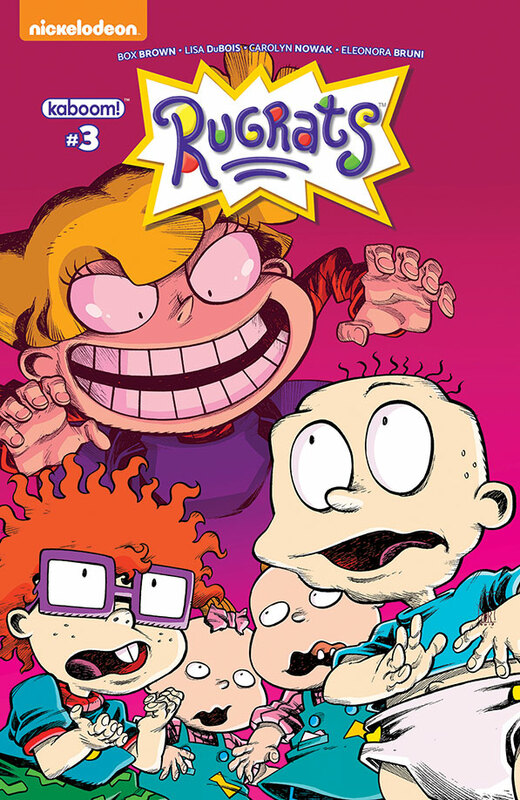 The first three issues of Rugrats are now available. Be sure to hit up your favorite comic book store so you can catch up on all of the babies exciting adventures. 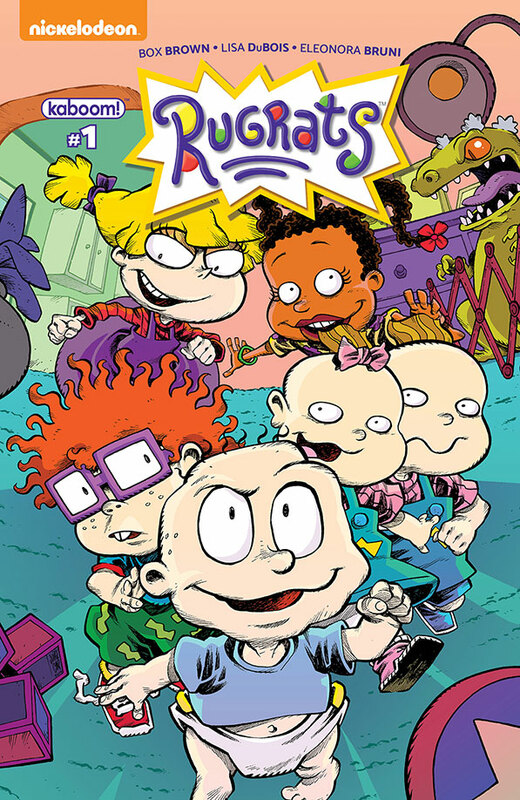 Each issue of Rugrats features a few different variant covers. The subscription covers feature a Rugrats scene on a lunchbox and thermos. There are also really cool DIY connecting covers, allowing you to bring the Rugrats to life by coloring them in to create one big scene. Can’t get enough 90’s nostalgia? 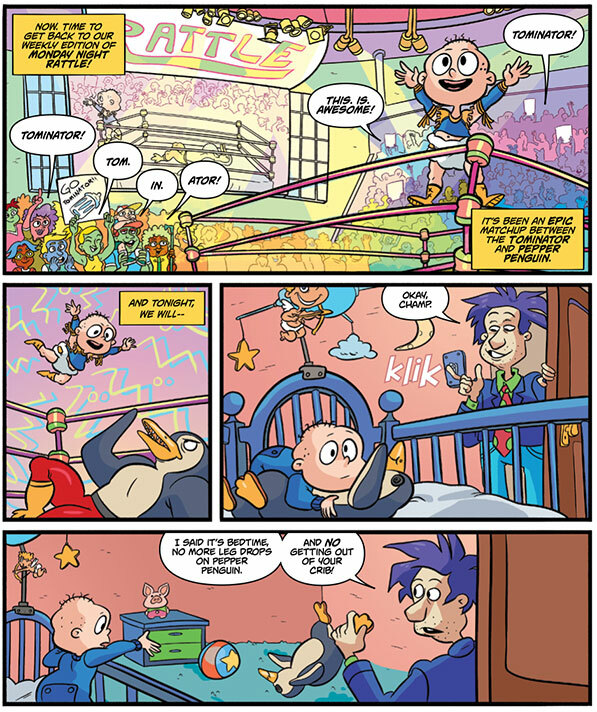 Read through a few pages of the Rocko’s Modern Life comic!